“Keith Brown MSP, the Minister for Transport and Veterans, will be in attendance and will undertake the handover of the project to Network Rail. Once the signing is complete, Network Rail will officially begin the construction phase of the Borders Railway project, which will re-establish passenger railway services for the first time in over 40 years from Edinburgh through Midlothian to Tweedbank in the Scottish Borders. “The new line will include 30 miles of new passenger railway with ten stops and seven new stations, allowing passengers to travel direct from Edinburgh to Tweedbank. It will offer a fast and efficient rail service and new travel options for people in, and travelling to Midlothian and the Scottish Borders. So now we can reflect on nearly 20 years of campaigning, and the key role played by CBR since its birth in 1999 to partially put right the injustice done to the Borders in 1969. Congratulations to one and all! Sorry – another (wee) delay! Transport Scotland today advised that the handover of the Borders Railway project to Network Rail will now take place early in the week commencing 5th November – not tomorrow. Not unnaturally, he assumed the announcement couldn’t be later than Wednesday 31st October! 31st October 2012 is the big day! Start shining those champagne glasses! Another indication that the railway really is coming – with thanks to Geoff Ruderham, who spotted this ad. The Campaign for Borders Rail 2012 Annual General Meeting will be held in the National Mining Museum at Newtongrange at 19.30 on Tuesday, 6th November. The Speaker will be Dr Ann Glen who will give a presentation on the re-opening of the Airdrie-Bathgate line. CBR is seeking nominations for replacements for the posts of Chair, Vice Chair and Treasurer, and nominations (to the Chair at his address on the Contact Us page on the web site) would be very welcome in advance of the AGM. Campaigners have got used to misinformation from John Lamont MSP, who describes the new railway as the “Galashiels Railway Project” – ignoring the benefits it will bring to a wide swathe of the Central Borders through bus-rail interchange and park-and-ride – but his latest effort plumbs the depths. A spurious new story in the Hawick News on 19th October ‘revealed’ that the cost of the railway has doubled from the original budget. Well, we knew that already, and it’s no different to the way that the cost of all three previous rail re-opening projects in Scotland increased from original budget to completion, ditto the M74 Northern Extension. And we know how much of a success these new railways have been. Bizarrely, Lamont viewed this old news as “yet another blow to the Galashiels Railway Project that would see it delayed once again. 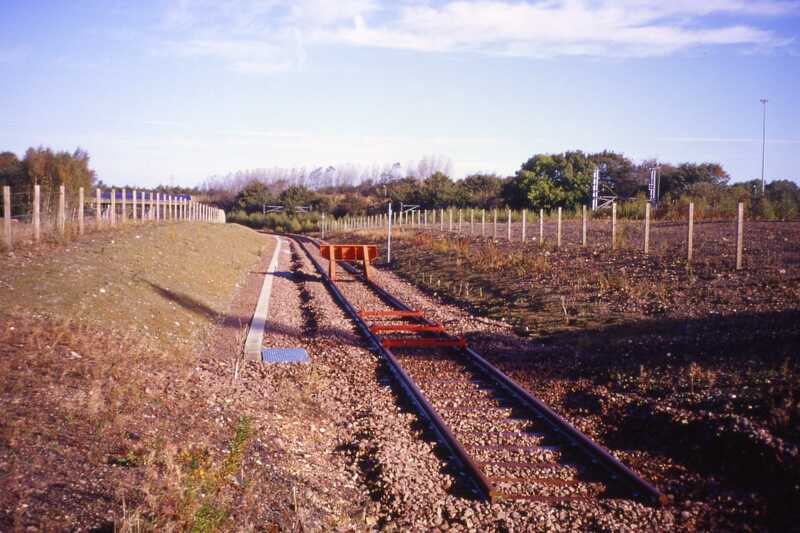 With nearly £54 million spent there is still very little to show for it as not a single piece of track has been laid yet.” He obviously hasn’t been at Millerhill since June 2011 (see photo above). Why can’t our political representatives get their facts right? This is David Spaven here – I’ve taken over blog administration on behalf of CBR, and hope to be able to make regular postings in the exciting period following the anticipated announcement – in the next couple of weeks – of the go-ahead for construction of the Borders Railway. I look forward to your comments on postings, and ongoing discussion on how CBR and others can help to ensure we get – in the words of CBR – ‘the best possible Borders Railway’ – by 2014-15. I will need to feel my way into this new role, so please bear with me if the technology initially gets the better of me! Just one request at this stage – it would be great if your comments were attributable rather than anonymous, unless of course your employment precludes this.